Personalized Seaside Residence Address Plaque - - 20" x 16" wall mount oval sign for a coastal residence. Made in USA. Personalized with the house number at the top and street name on the bottom. Line 1 for the house number holds up to four (4) numbers. Line 2 for the street name holds up to 8 characters. HDU (high-density urethane) construction with engraved design elements. The text, borders, and large seashell image in the center are engraved into the HDU substrate. The sign is hand-painted with an artist brush for the lettering, a roller for the background, and with an airbrush for the shell. The entire sign is finished with clear-coat. Dimensions: 20"W x 16"H x 1.5". Please allow 7 to 8 weeks for delivery. 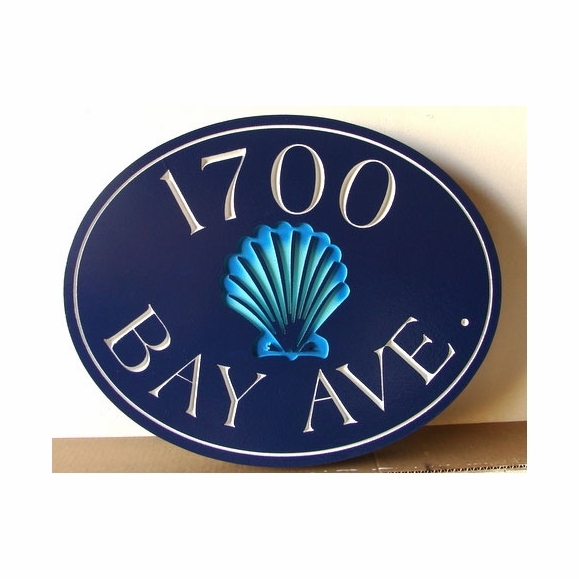 An upscale, yet simple, personalized address sign for beach town locations.